Seattle - TODAY at 10 AM Washington Governor Jay Inslee is scheduled to make an official announcement with family and friends at A&R Solar in South Seattle. Gov. Inslee also released a video this morning about his plans. 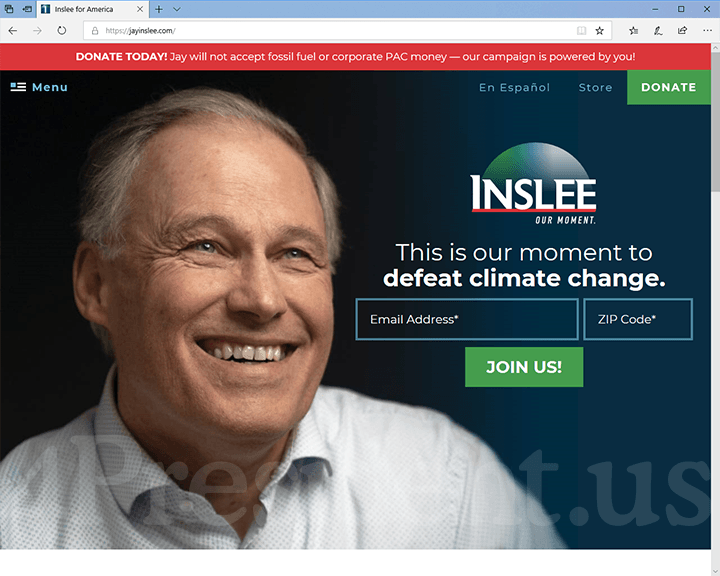 In the video, Inslee says “this is our moment” to take action on climate change by electing a new president. A&R Solar is a Seattle-based solar installation company that opened in 2007 with a team of just two. Today, A&R Solar employs over 70 workers, thanks in large part to Gov. Inslee’s policies to grow Washington’s clean energy economy—including by signing the 2017 Solar Incentive Jobs Bill. A&R Solar was named one of Washington’s fastest-growing private businesses by Puget Sound Business Journal. Fighting climate change has been the driving force of Jay’s public life. Elected as governor of Washington in 2013, Jay has been known as America’s “greenest governor.” He co-founded the U.S. Climate Alliance in 2017 and he has passed significant laws that make Washington a national leader in the clean energy economy. In 2013, Jay created a new Clean Energy Fund, which has invested more than $100 million in developing and deploying innovative energy technologies, and growing clean energy businesses and jobs. The video released Friday was co-produced by Jason Koenig—a native Washingtonian director known for his award-winning work with artists Macklemore and Ed Sheeran—and Dan Kully, a nationally-recognized political media consultant who has been a critical part of successful Democratic campaigns across the country. Voice: Hi governor, what do you have to say about climate change? "We got to stop global warming. Everyone in this country know climate is changing. Reduce carbon pollution. New energy future. Climate change. Climate change. We should be dealing with climate change. Climate change. Climate change. We need to defeat climate change. That's what I believe." We're the first generation to feel the sting of climate change. And we're the last that can do something about it. We went to the moon and created technologies that have changed the world. Our country's next mission must be to rise up to the most urgent challenge of our time: defeating climate change. This crisis isn't just a chart or graph anymore. The impacts are being felt everywhere. We have an opportunity to transform our economy, run on 100% clean energy. That will bring millions of good paying jobs to every community across America, and create a more just future for everyone. I'm Jay Inslee, and I'm running for president because I'm the only candidate who will make defeating climate change our nation's number one priority. We can do this! Join our movement! This is our moment.